I had watched Life of Pi, the movie, early this year and remember liking it a lot. The visuals were fabulous, the tiger majestic and the story compelling. The ending was twisty enough for me to question everything I saw on the movie until then. Piscine Molitar Patel, aka Pi, prefaces his story by saying that it will make his interviewer believe in God. I can't say that his story had any such impact on me, since I knew this was fiction, but were his story true, then it would be one of the most spirited stories of human courage I would have ever come across. Pi's family in Pondicherry was sailing to Canada soon, along with some of the animals from the zoo that Pi's father managed. The ship however sinks one night when Pi was out on the deck, and that more than anything else, saved his life. He jumped and swam on to a lifeboat and soon found out that he was the lone human on the boat. He was sharing it with a zebra, an orangutan, a hyena and a lion. Not looking like a cozy group already. The zebra had a broken leg and the orangutan looked horribly famished. The hyena however, after a lot of circus, killed and ate the zebra and later the orangutan as well. However, it met its end thanks to the tiger. From then onward, Pi and the tiger, who was named Richard Parker, share their long tumultuous journey, with a few misadventures but with plenty of caliber-testing challenges. There are days they go without food and days when they feast on something huge. Very early on, Pi had to establish territories to make sure Richard Parker knew where he belonged. He made sure that whenever he caught a fish or a turtle, Richard Parker was well-fed as well. Pi was incredibly resourceful, and despite the circumstances, kept his wit around him all the time. He was a vegetarian all his young life, and he had to get acclimatized to eating meat, raw that too, to survive. There are a lot of other things he attempts to eat and I will not name them here, but they made me want to puke. To me, the strength of the book lies in Pi's journey on a lifeboat with the tiger. But that doesn't start until a third of the way into the book. The first few chapters spent on narrating Pi's childhood life went dragging on forever. Part of the problem was already knowing the story. The other part was feeling unmoored - not knowing where the author was going with all that background on Pi. Some of it does become relevant later on, but it could have been a lot more concise. Once they sailed on the ship, however, things got very fiesty and interesting. 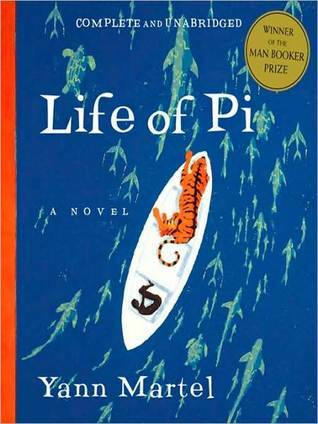 Other than having a fascinating story and some very vivid visuals, Life of Pi is also very thought-provoking. I cannot even begin to fathom how one can survive in the ocean for months, hoping that someone will rescue you or that you will reach friendly land soon. Worse, how do you take care of your food needs? You cannot cook, you cannot stock. You just eat what you can catch and hope that it won't kill you. Pi mentions that having Richard Parker to train and to fear helped him keep his sanity around. There is still a lot he does that he wouldn't do if he were living comfortably in his home with food and water around. That makes you wonder what it takes for a person to bend his beliefs and start embracing anything. What makes Life of Pi so stimulating is that Pi is talking to the reader. Or rather to a guy who is interviewing him, but the reader may as well be that person. The author manages to create a setting so fantastical and arresting yet so believable that I wanted to know more and read more. Already having watched the movie gave me a visual to build upon in my mind but even otherwise, his descriptions are very lovely. About the narrator: The narrator, Jeff Woodman's, Indian accent sucked. I cringed horribly when he badly mispronounced certain words. I get that he was trying to give an Indian voice to the character, but I really wished an Indian narrator did that job. Most of the first half of the book left me feeling annoyed but after that I was able to just get used to it and move on. Mind you, I don't get bugged by wrong pronunciations - that is very normal and everybody does it. I guess since this was an audiobook, I had an expectation to hear words in their correct pronunciations, be it a Spanish, Russian, Arabic or Indian word. Towards the end, we had Pi conversing with two Japanese characters. They all had the same accent. It was really hard keeping them apart - sometimes what they were saying helped keep things straight, other times, I just had to assume based on nothing. Other than the accent issues, the narrator did a pretty good job of maintaining the flow of the story and conveying the jokes in the book well. I listened to the audio years ago when it was first released and recall how much I loved this one. The movie was very good as well. It's been a while since I read this but I'm the one person who didn't love it. At the end of the book, I felt like I'd missed something. I think there was a lot of symbolism that was over my head. The accent issues sound really jarring. I wonder why they wouldn't just hire an Indian actor to read the audiobook? Yay! Glad you liked the book and movie too. I can't say I would have understood the ending had I not watched it with my family. There was some symbolism in there and I guess it was meant to question us which story we believed. Even though it confused me some, I liked that twisty ending because I thought it taught a lot about perceptions and how everyone can interpret things differently. I know, right? It was beyond irritating. Sounds good but I totalllly get what you're saying about the narrator. Awesome review. How interesting that you say the first part goes on forever; I found that to be so true that I abandoned the book eventually, without finishing it ever, which is something I hardly ever do. I just couldn't bear the tedium! Yet, I've often lamented the fact that I seem to be one of the few who doesn't just rave about The Life of Pi. I think I should go back and pick it up, some day, but at least tonight you've assuaged some of my shame. I wish they had invested in an Indian narrator. It may really not bug someone who doesn't know how to pronounce the Indian words but to me, it was grating. I'm reading this one right now - and sounds like it's a good thing I'm reading rather than listening! I hate when narrators try to do accents they are not capable of pulling off. Publishers should be more careful of that - it's really inexcusable. I cannot wait to hear what you think of it. I thought the book was pretty good, once you got past all that rambling at the start.